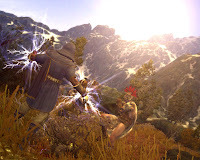 Age of Conan: Hyborian Adventures is a massively-multiplayer online roleplaying game (MMORPG) based on the world and works of acclaimed author Robert E. Howard. In Age of Conan, players enter Hyboria with thousands of their friends and enemies to live, fight, and explore the dark and brutal world of King Conan. * An advanced combat system lets you choose every cut, thrust, and swing in real time. * Groundbreaking graphics plunge you into a world of breathtaking beauty. * A massive fantasy world based on over 75 years of books, movies, art, and music, developed in close collaboration with Conan Inc. to ensure the most realistic Conan experience ever seen. * An unprecedented character development and customization system with combo attacks, skills, special abilities, and deadly spells ensures no two characters are exactly the same. * Massive Player Versus Player combat. Capture battlekeeps and wage epic warfare between players and guilds, or hire yourself out as a mercenary and battle for pay! * New and exotic classes, such as the Demonologist, Herald of Xotli, and Dark Templar, along with incredible twists on classics like the Ranger and Assassin. * A detailed and engrossing crafting system, allowing you to make everything from armor and weapons to an entire city! * Hundreds of unique quests for combat and crafting with extensive NPC interaction and voice acting, immersing you in the living world of King Conan. * An extensive story-driven single player adventure to start the game drawing you deep into the scheming, seduction, intrigue, and betrayal of Hyboria. 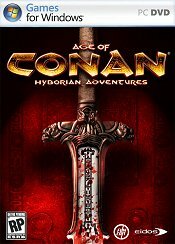 Funcom just canceled the Xbox 360 version of their MMORPG Age of Conan: Hyborian Adventures, something that isn’t very surprising considering the lack of information on the port. Funcom announced that Age of Conan: Hyborian Adventures received the award for "Most Improved Game of 2009" from MMO website MMORPG.com. MMORPG Gate is a MMORPG Games site and directory with Online Games, Podcasts, News, Reviews, the best Features, Videos and more. We provide in-depth coverage of games such as World of Warcraft, Aion, APB, Guild Wars 2, Champions Online, Star Trek Online, Star Wars: The Old Republic and many more. Don't forget to check out our fantastic features such as our Top 10 MMORPG Games, MMORPG Games that failed, Sensuality and the MMORPG and many more. MMORPG Gate is part of the same network that features Free MMO Gamer (Free MMORPG Games) and Free PC Gamers (Free PC Games). All the greatest info on massively multiplayer online role playing games is here!